Writing after a long long time. These few days I was absolutely burdened and couldn’t even enter my kitchen with the right state of mind to cook something new. With all the calorie consciousness all of us have really started avoiding potatoes and as such any high calorie fruits and vegetables. But you know what at times you also need to give a break to the thinking procedure and pamper your taste buds. The dum alu is all about pampering that secret emotion of yours, which is now almost covered with the weight of the calorie conscious thoughts. I tried this out yesterday, and had it with paratha. But I felt that this would as good as a snack on an evening enjoying and partying with friends. Take the vinegar in a small bowl and add julienned ginger to it. Keep it aside for the ginger to soak. Boil the potatoes un-peeled with 1 teaspoon of salt, don’t over boil. Just boil them till the hardness goes off. Take them out, drain the water and peel off the skins. Cut the potatoes into halves if they are of medium size. You can also use the smaller potatoes, then don’t need to cut them into pieces. Julien the onions and keep it aside. Heat oil in a wok. Add the oinions, garlic cloves and saute’ till the onions start becoming golden brown. Add the ginger-garlic paste and sauté till the fried smell comes out. Add turmeric powder, chilli powder and salt along with two cups of water. As steam starts coming out, add the boiled potatoes. Cook till the potatoes become soft. you can add water in the way if it gets too dry. Add the sugar and mix well. Take the potatoes and keep in a serving bowl. Garnish with the soaked ginger and chopped coriander leaves. Instead of mustard oil you can also use vegetable or sunflower oil.Enjoy the DUM ALU with roti, paratha or just as a snack in a lazy evening with friends and family. Happy eating and happy cooking. 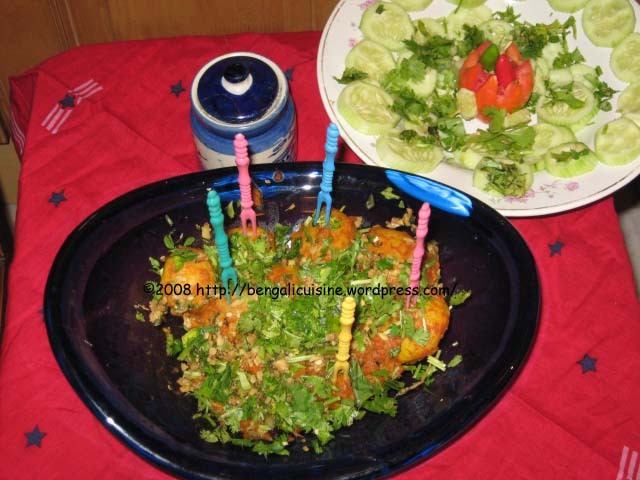 I am a bong but didn’t know cooking.I got married recently in a non bengali family & guess what they are vegetarians.Your recipes are helping me to grab the accolades. Thanks you just cant suffice for you help. Want more veg recipes please. Thank you so much for that lovely comment. I am on a move for the last couple of months and was unable to post anything. Please bear with me and I promise we’ll be back with lots of recipes soon. I tried your Alur Dum. First time doing a vegetarian Indian dish. Worked very well. All 9 people enjoyed it.